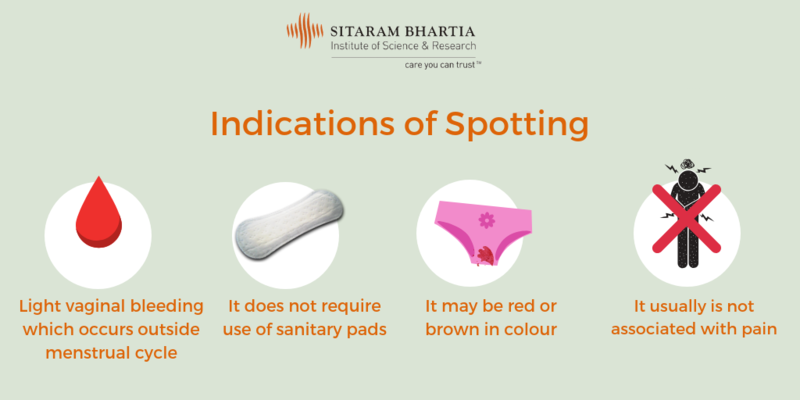 What Does Spotting Mean: Before Period and During Pregnancy? Spotting is any light vaginal bleeding that occurs outside your regular menstrual cycle. It usually involves a small amount of blood. What are signs of spotting? Two women, Akansha and Sulekha, visited Dr. Priti when they experienced spotting and were unsure of what action to take. Spotting before period – What should be the course of treatment? Lately Akansha Dey, 22 has been experiencing discomfort in her vaginal area. One day she noticed spotting when she came back from work. Concerned, she called her gynecologist Dr. Priti who asked her to come in for a check-up. After a detailed history and pelvic examination, Dr. Priti and Akansha discussed the probable causes behind the spotting. What are the gynecological causes of spotting? The first step was to rule out a possible pregnancy. Akansha took a pregnancy test which turned out to be negative. Spotting is a common side effect of emergency contraceptive pills. Dr Priti asked Akansha about her contraceptive use. Akansha hadn’t taken any emergency contraceptive pill or changed her contraceptive methods, so this eliminated the possibility of spotting occurring because of pills. Infections like yeast or undetected sexually-transmitted infection (STIs) may also cause spotting. Upon hearing this, Akansha mentioned the discomfort and irritation in her vaginal area. To confirm whether the spotting and irritation were caused by the infection, Dr Priti suggested a few tests to Akansha. Akansha was worried and wanted to know other possible causes. Spotting may also occur when there is an abnormal growth in parts of the uterus or cervix. Conditions like uterine or cervical polyps are benign but may cause unscheduled bleeding. If you have endometriosis, you may notice spotting before and/or after your menstrual cycle. Some women may even experience it both the times and it is often associated with pain. Based on Akansha’s test results, it was found out that she had a minor yeast infection. Akansha required some medication and care which comprised of practicing proper vaginal hygiene and use of local antibiotics for the infection. Sulekha Randhawa had recently confirmed her pregnancy. When she noticed brown discharge, she immediately panicked and booked an appointment with Dr Priti. Spotting during first trimester occurs in nearly 27% of pregnancies. However most women have a favourable outcome. Based on Dr Priti’s suggestion, Sulekha underwent the pelvic examination and ultrasound to confirm the location and viability of her pregnancy. Sulekha was relieved when her tests turned out normal and everything was fine with her baby. She was asked to come in for a follow-up checkup soon to make sure that her pregnancy was progressing normally. If spotting occurs during the second trimester of pregnancy, it could be a warning sign for things to come. It could be an indication towards low-lying placenta or a placental abruption. If you have low lying placenta, the first bleed may be a warning sign for a second impending bleeding which would be bigger. Sometimes spotting during pregnancy could be a sign of incompetent cervix wherein, weak cervical tissues results in cervix opening too early and leading to loss of pregnancy. Spotting during pregnancy can also occur because of vaginal infection or cervical polyps. Sometimes there might not be a definite cause for the bleeding. Apart from the above causes, vaginal bleeding in the third trimester may indicate the onset of labour. In Sulekha’s follow up checkup, her tests assured that there was no reason to worry. Her pregnancy progressed normally and she is currently in her second trimester. What should be the treatment for spotting during pregnancy? You may also require regular check-ups.